A New Paper Craft Crew Sketch Challenge! Here is this week’s sketch challenge for you – don’t you love how the focal image isn’t straight up-and-down?! This Bundle was one of my first purchases, so of course I had to also get the coordinating Carried Away Designer Series Paper for free from the Sale-A-Bration brochure! 🙂 I just love how the free items coordinate with so many of the stamp sets in the new Occasions catalogue. I pulled my colours from the pattern that I chose – isn’t it fun, how it looks like an aerial view, looking down from the hot air balloon? 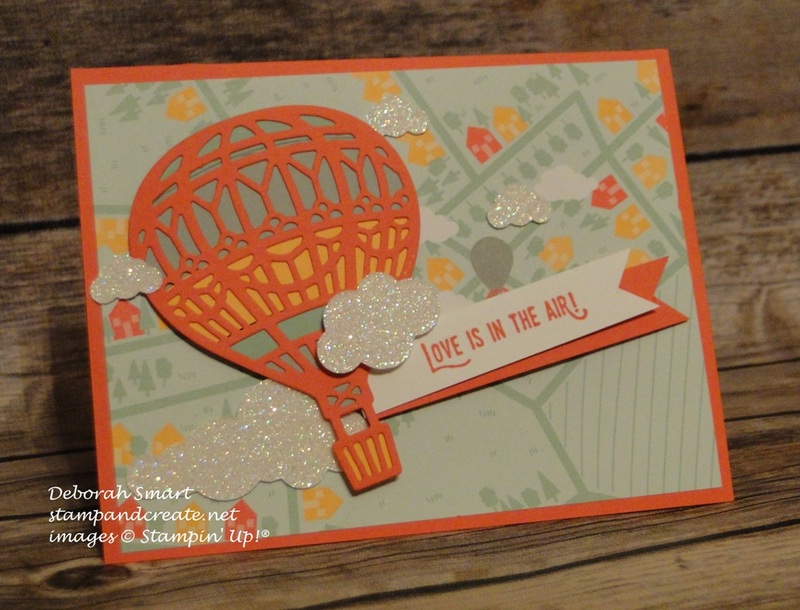 I die cut the balloon outline from Watermelon Wonder cardstock, using the Big Shot and the Up & Away Thinlits Dies. Using the Precision Plate when die cutting this detailed thinlit makes the pieces practically all fall out! For my balloon ‘stripes’, I die cut pieces of Mint Macaron, Smoky Slate and Peekaboo Peach cardstock, and used the Multipurpose Liquid Glue to attach them at the back. I die cut the clouds from Dazzling Diamonds Glimmer Paper – the sparkle really makes them ‘pop’ off the page (also with the help of Stampin’ Dimensionals). The sentiment is from the Lift Me Up stamp set, stamped in Watermelon Wonder ink onto Whisper White cardstock. I used my Paper Snips to cut banner tails in that piece, and the piece of Watermelon Wonder cardstock layered below it. I hope you enjoyed seeing my card – you’ll want to check out what the rest of the Design Team created for you, over on the Paper Craft Crew page. Then link up your own card for the challenge – I can’t wait to see what you create! If you don’t already have your own demonstrator, and would like to purchase the supplies to make this card yourself, just click on the images below, and you’ll be taken directly to my online store. Previous Previous post: Can’t Get To Class – Class Comes To You!